Japan – or “Nippon” in Japanese: In my dreams as a kid, this was about the most distant country you could ever go to. 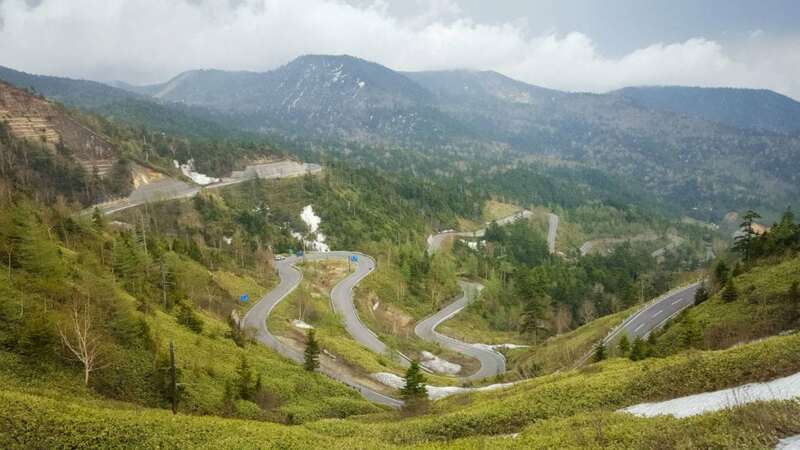 And suddenly it was there: the chance to go on one of the latest tours Edelweiss Bike Travel has to offer in the Far East. The tour is called Secrets of Japan and the name says it all. These two weeks are all about discovering, exploring, and unveiling the gems of this mysterious country. Starting off in the immense capital Tokyo with about 40 million (!) inhabitants including the suburbs, the first thing which attracts attention when entering the Narita airport (one of the two big airports in town) is that everything is very efficient and very clean. Generally, everything about this city is just a bit different from what you might be used to in other cities in the world: It offers beautiful, modern architecture, comfortable walking boulevards, stunning viewing points, fancy restaurants etc. And it took me a while to discover what is also different from most other big cities: It is relatively quiet, as the speed limits on the streets are quite low, for example: The speed limit on the highway is 80 km/h (about 50 mph). Also, the Japanese people are very polite and friendly, in traffic as well as in daily life. With a big smile on their face, they are always helpful to guide you, whether it is in the fantastic hotels, at the lunch breaks or at any place where the western tourist has problems deciphering the Japanese signs. This already got us in a very good mood to start this tour – in addition to our fantastic hotel in Odaiba, a part of town in the southern part of Tokyo. 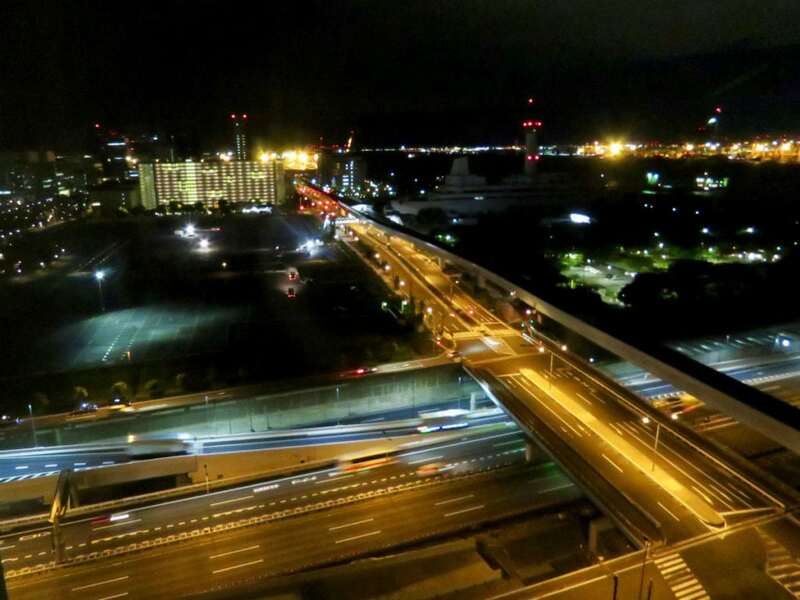 It is close to the sea side and offers wonderful views over downtown Tokyo, which is most beautiful at night when watching it from the roof top bar at the hotel. The next day, after our welcome briefing, where the tour guides told us everything about the ins and outs of the Japanese traffic (left-handed! 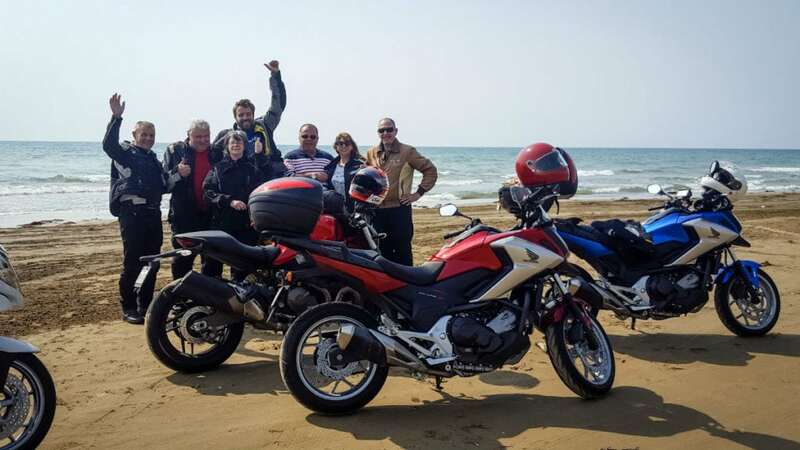 ), habits and culture, we received our motorcycles and met our local tour guides, who took care of the luggage transportation and dinners and helped us out with all the language problems on our way – a very helpful and comfortable idea! Eventually, after finishing all the paperwork, it was time to do what everybody was waiting for: riding the bike in the land of the rising sun! This tour through Japan thereby leads through Honshu, the biggest island of Japan, and not only includes visits to the big cities of Tokyo and Kyoto, but also a ride onto the holy mountain Fuji, which we circled a couple of times, as this 3376 m (12389 ft) high volcano is prominently present. Especially with clear weather conditions, this beautiful landmark can be seen from far distances and is a thankful subject for thousands of pictures taken every day. Our tour ran clockwise over the island of Honshu and took us from one surprise to the next: riding out of Tokyo over amazing expressways, then next turn off into lush green areas on very well maintained curvy roads, ending at the seaside and following beautiful coastal roads – it is one big feast for all senses. And then we had the first evening at our hotel – in real Japanese style, which means having a very low table, a chair (which is actually only a backrest) and a cushion in the room, so you are supposed to sit on the floor and sleep on a mat. All this immediately gives you a feeling of calmness and peace. In addition, we also found the so-called yukata in our rooms, which translates to “bathing clothes”. This piece of clothing is based on the traditional kimono, but made of cotton instead of silk. 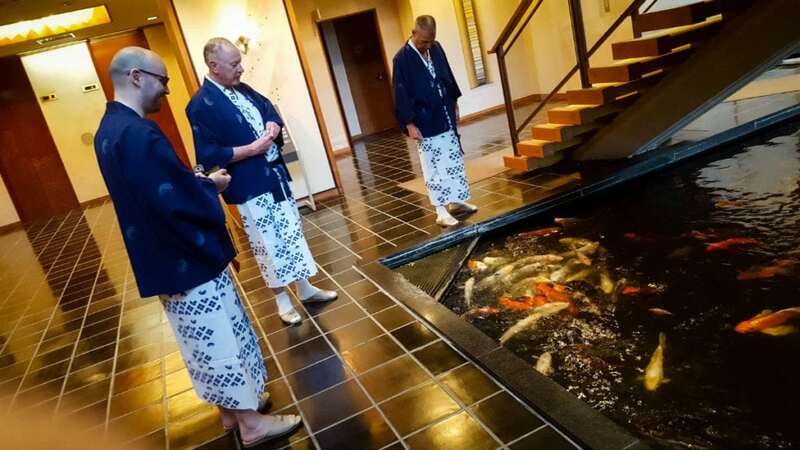 The idea behind it is that you change clothes, put on your yukata and then go to the “onsen”, which is a very traditional ritual bathing ceremony. As there are a lot of geysers and hot springs in this country, their water is used in the onsens. You first completely wash yourself and then relax in the hot water, which is said to have a healing effect. It is very relaxing, so after a day on the bike the first thing was visiting the onsen to relax a bit before going to dinner. Talking about dinner: This only would be worth a trip to Japan! The tables are covered with all kinds of small dishes and drinks and the atmosphere is just fantastic. 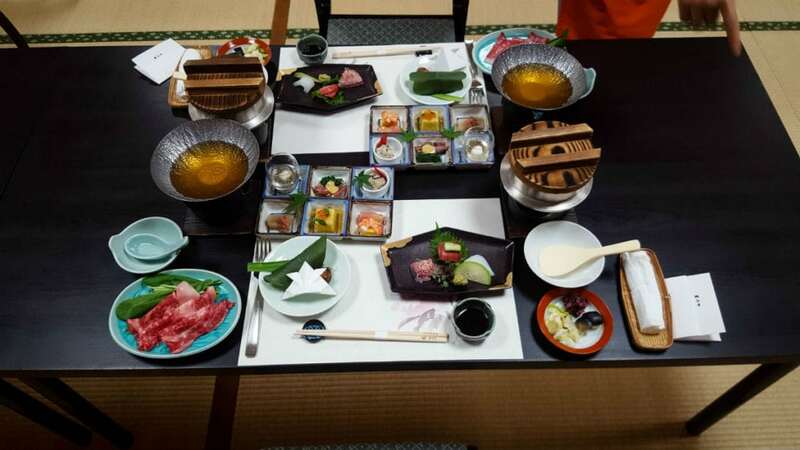 For most of us, who visited Japan for the first time, it was quite an experience to find out what every dish was, and then finding out that everything is very tasty. It took us a couple of days of dining to recognize the various fish, vegetable and rice meals, but in the end, everybody was pretty comfortable with it as well with eating with chopsticks. 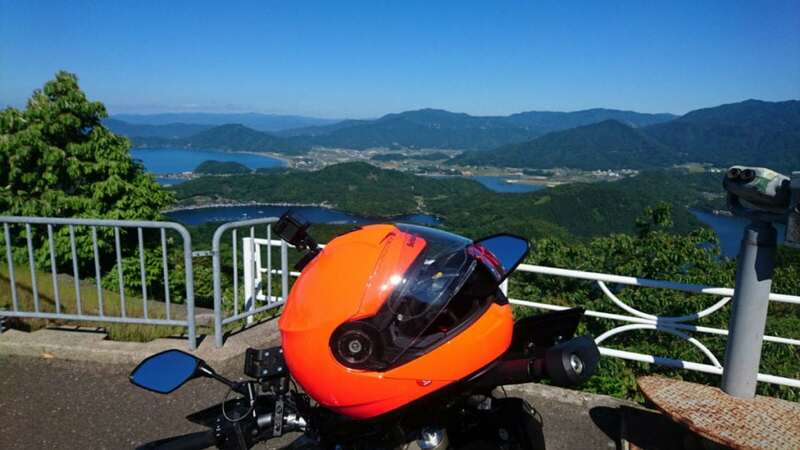 Everything is a feast for the eye when riding the island of Honshu: from winding and twisting roads to numerous rice fields up to impressive mountains in the background – you can’t get enough of this amazing country. You will find beautiful temples or temple complexes everywhere and some of them will surely stick in your mind forever, for example the amazing Rokuonji temple in Kyoto, better known as the Kinkakuji temple, which means golden temple. 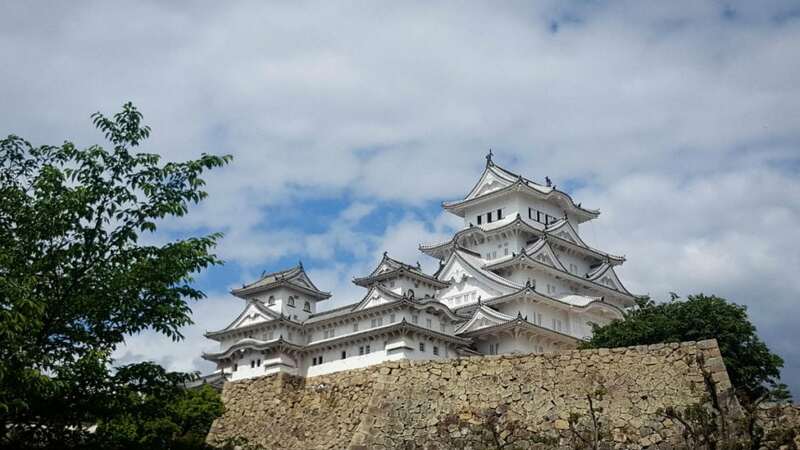 Or the majestic temple complex of Himeji, a white castle, which stands out high above the city’s skyline. During the tour there is also enough time to explore some of the big cities, for example Nikko and Kyoto. Especially in Kyoto there is an unbelievably wide array of interesting places to visit, for example the impressive “Geisha district”, also called Gion. 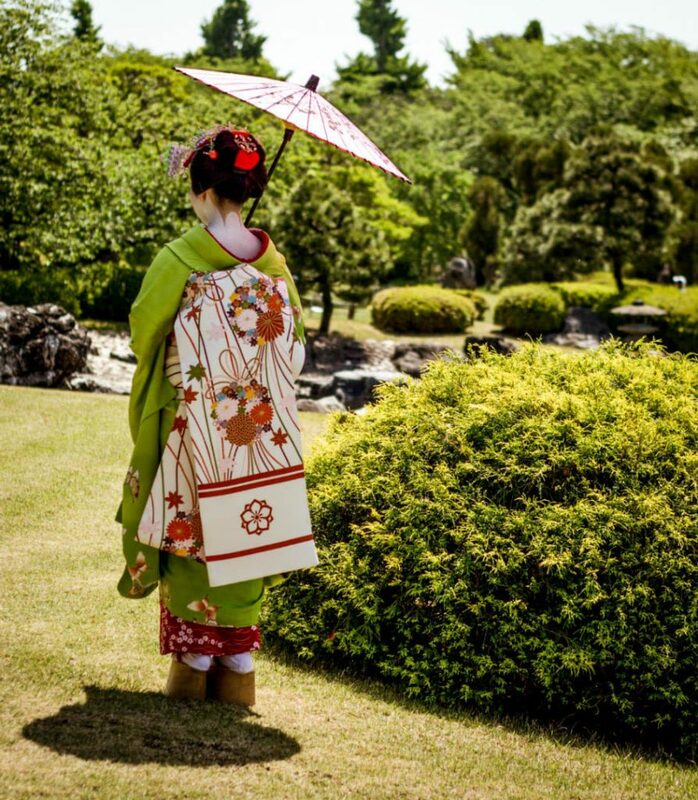 In this birthplace of the Geisha culture you can regularly see a Geisha on her way to work. Or you can take a nice walk in the Sagano bamboo forest, where you will have the possibility to try a very tasteful cup of green tea. There is something to see and to do for everyone in this fascinating city! Following our way over the beautiful roads of the island Honshu is a real treat for all senses. There is a new view in front of you around every corner, and each is worth being photographed – GoPro’s and other video- or photo devices are at work non-stop! Riding the scenic pearl road on the Shima peninsula with its maritime atmosphere or cruising through the Yoshino-Kumano national park, famous for its numerous cherry blossoms, will take your breath away! Halfway through the tour we are around the city of Fukui and the Noto peninsula where, at almost the end of the riding day and with the Japanese sea at our left side, we suddenly take an exit towards the beach and enjoy ourselves while riding the Chirihama Nagisa beach driveway. Hard-packed sand allows even some tour busses to drive on the beach. It is a spectacular ending for the riding day with a lot of fun! 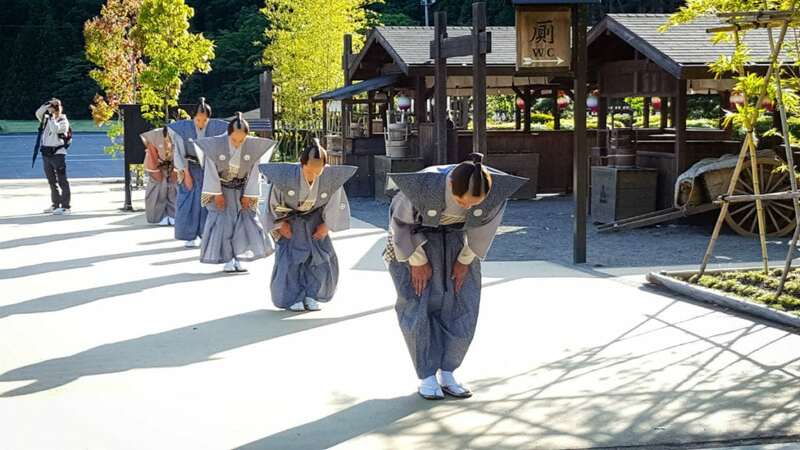 Suddenly there are only four days left of the tour and still we have so much to see, for example the Shirakawa-go region along the Shogawa river, an absolutely gorgeous place and UNESCO world heritage site, where you find some villages with the famous gassho-zukuri farm houses, some of them over 250 years old. Then it is time to ride the Mount Shirane Road, which is the highest paved road of Japan. 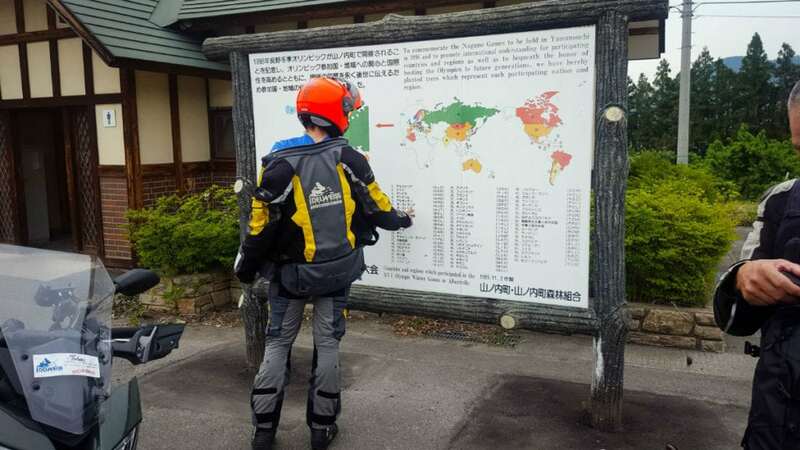 This is an absolute “must-do” for anyone who visits Japan on a motorcycle: We enjoyed fantastic winding roads with breath-taking views and ended up in the village of Kusatsu, where we got to see the largest natural flow of hot spring water in Japan. Of course, our group immediately went to the “onsen” again after this riding day, especially since it is said that the water cures every illness, except for love sickness! 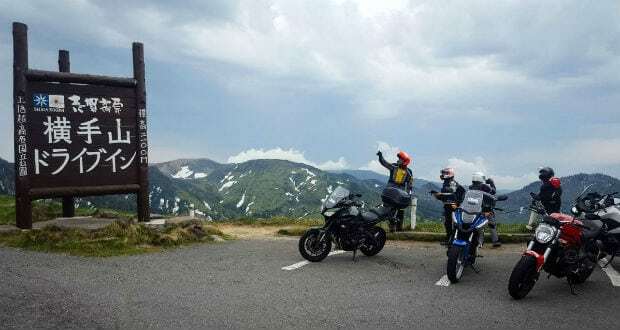 The last two days riding towards Nikko are filled with beautiful scenic roads and amazing views – you just can’t get enough of this beautiful country with its huge variety of landscapes. A last nice rest day in the city of Nikko and then the last riding day arrived. 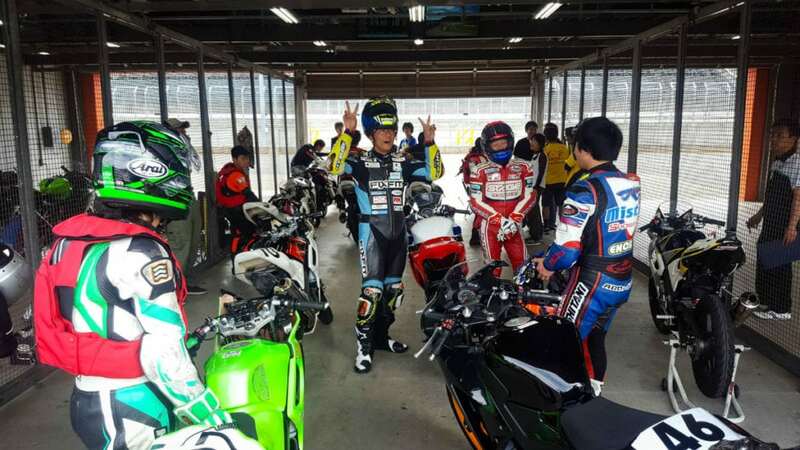 But before riding back to our start hotel, we paid a visit to the famous twin race track of Motegi. This fantastically located racetrack is always well-visited, not only because of its great Honda Collection hall, which holds numerous motorcycles and race cars in an impressive building, but also because of the possibility to ride on the racetrack yourself (which is done by countless groups of enthusiastic motorcyclists from all over Japan). Eventually, we reached the last stretch of the route into Tokyo. We rode mostly on expressways, but what a view! It couldn’t be better than this: The evening light over the great skyline of Tokyo took everyone’s breath away! After giving back the bikes, hundreds of memories of this amazing Edelweiss Secrets of Japan tour were shared at the final dinner. A bit sad to leave, we say goodbye to all our new friends we made from all over the globe and are very happy with this new experience of riding in this amazing country! 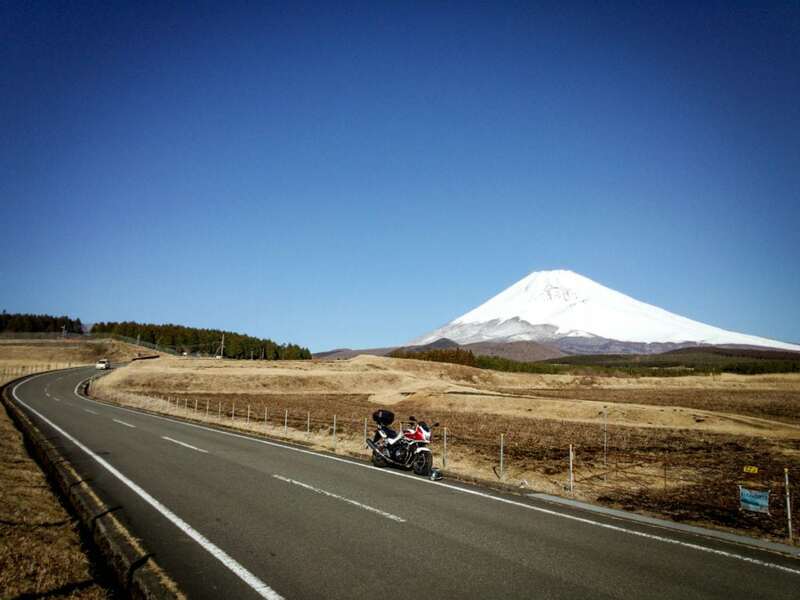 Click here to find out more about Edelweiss Bike Travel’s Secrets of Japon motorcycle tour! Or check out Edelweiss’ Ireland tour or Eastern Europe tour. 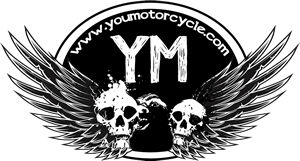 Previous: Can I Shift Gears in a Car If I Can Ride a Motorcycle?